GENEVA, Ill. - The WTTW Kids Readers are Leaders event is coming to Fifth Third Bank Ballpark on Sunday, August 14 before the Cougars take on the Cedar Rapids Kernels for Back to School Night at 1 p.m. To purchase tickets, visit www.kccougars.com. Gates for the event will open at 11 a.m. with festivities beginning in the Music Garden, presented by the Acres Group, at 11:15 a.m. Each person with a ticket for that day's game will be allowed entry into the ballpark for the free, family-friendly event. Featuring sing-along songs and interactive stories with Miss Lori's CAMPUS, the event is geared towards young children and their families to help support literacy development throughout the summer. Click here for more information about Readers are Leaders. In addition, WTTW and the Cougars will be holding a book exchange. Fans are encouraged to bring a gently used book to the ballpark where they can exchange it for a new book to take home and enjoy. Illinois Senator McConnaughay will be on hand to provide fun activities for kids and their families in the Cougars KidZone area, presented by Rainbow Play Systems, as well as raffling off backpacks full of school supplies to help kids as they head back to the classroom this fall. The game is also a Sunday Funday, presented by Dave & Buster's, which includes free entertainment and discounts for kids in the KidZone area. Activities include pre-game Catch on the Field and an autograph session with Cougars players. The deals don't stop there as Sunday is Kids Eat Free at the Cougars with all children between the ages of 3 and 10 receiving a voucher at the gate for a free hot dog and small soda. Following the game, fans of all ages will be able to run the bases. 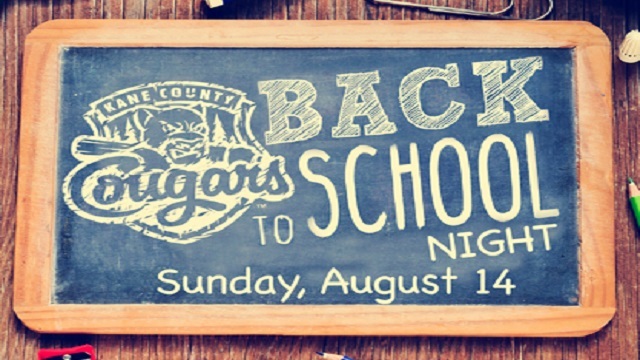 To purchase tickets for Back to School Night, and participate in the WTTW Kids Readers are Leaders event, contact the Cougars box office at 630-232-8811 or visit www.kccougars.com.